The Ketchum Cemetery needs more space for burial sites and wants to clean up the boundaries of the final resting place. It’s asking the city of Ketchum to vacate portions of platted but undeveloped streets to ease the squeeze. On Monday, the Ketchum Planning and Zoning Commission held a public hearing on a revised proposal to vacate public rights-of-way at the request of the Ketchum Cemetery District. The P&Z unanimously voted to recommend to the City Council that portions of land be vacated along 10th Street and Walnut Avenue. The portions included two unimproved sections of 10th Street, an unimproved section of Walnut Avenue and an unimproved section of alley. “The cemetery board reviewed the other areas in 10th Street and determined that it really wasn’t feasible or cost effective to utilize that portion of 10th Street that goes up on the hill,” said Benchmark Associates land planner Garth McClure, who represents the district. The district had originally wanted more. 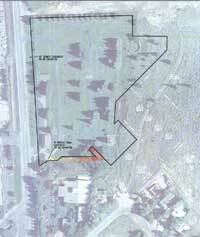 In 2004, Ketchum entered into a 99-year lease agreement with the Cemetery District for two town-site lots for uses that are unclear, though the two lots in question appear to be designated mainly for walking paths, according to information provided to the P&Z. At a July 14 meeting, the P&Z requested an updated master plan from the district to clarify the uses. In response, the district reduced its proposal to areas it already maintains so a new master plan wasn’t required, according to City Planning Manager Joyce Allgaier. However, if the cemetery board wishes to request vacations in the future or seeks to amend the lease, it would need to produce an updated master plan. In a May 1 letter, McClure asked the city to amend the language of the 99-year lease to omit a clause that allows the city to terminate it with 60 days written notice. He withdrew the request Monday night. As part of its approval, the P&Z recommended the addition of a public access easement, a 10-foot utility easement along the cemetery’s western boundary along state Highway 75 for an existing sewer line. It also recommended that no fence be built along the 10th Street right-of-way. The P&Z also considered access to a primitive trail that crosses the area via a pedestrian or bike easement across two lots and proposed that the district connect Walnut Avenue to Highway 75 through a 5-foot easement. McClure said the district would come back and finalize boundaries of the new plat once it’s approved by the City Council.